Miracle Mile Chamber members! WE HAVE SOMETHING TO CELEBRATE! Los Angeles High School originally opened in downtown LA in 1873. However, on September 10, 1917, after relocating four times downtown, LA High opened its doors at its new, permanent home located at Olympic & Rimpau. 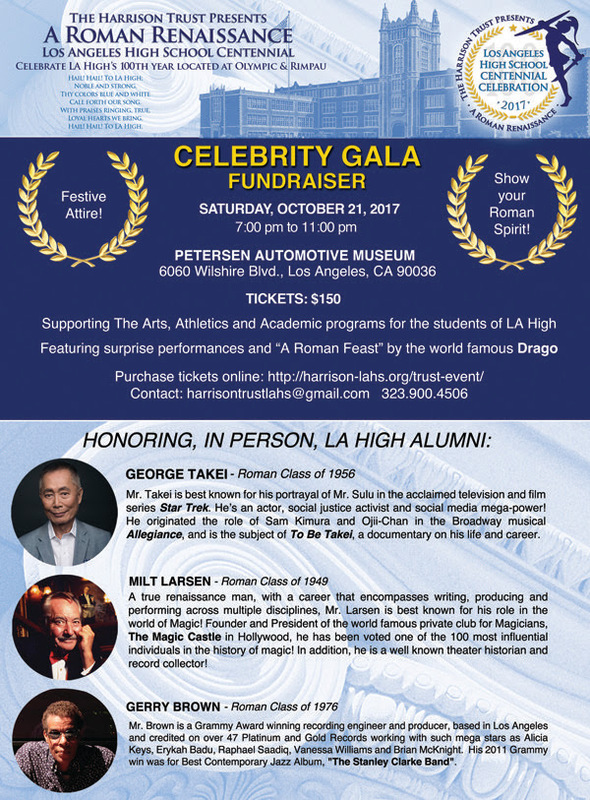 On October 21, 2017, please join us for our Roman Renaissance Centennial Gala at the fabulous Petersen Automotive Museum, as we celebrate 100 years at Olympic and Rimpau. 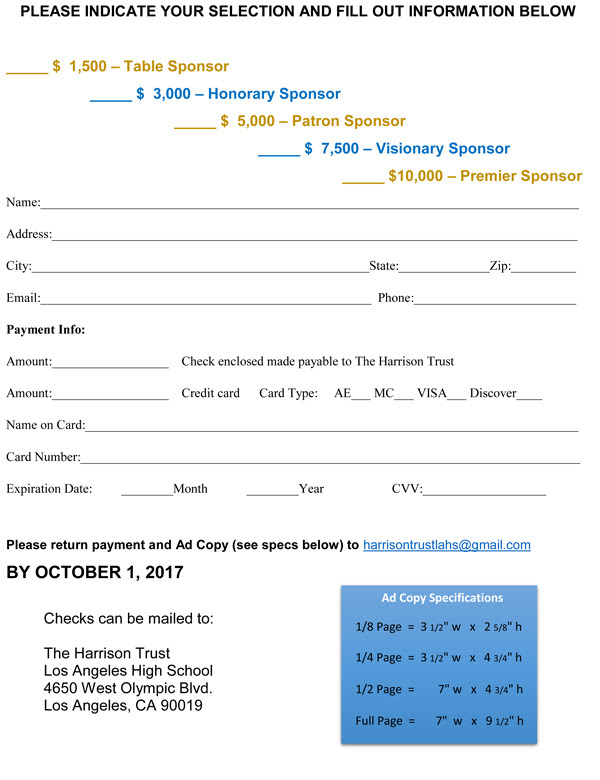 HERE’S WHAT YOU CAN DO TO HELP SUPPORT LA’s FIRST HIGH SCHOOL! – GOOD: Purchase an ad in the 48 page full color souvenir program. Reasonable prices AND a good cause. The program will be given out at both our October 20th Homecoming game AND our Celebrity Gala on October 21st. See attached price sheet. – BETTER: Buy a ticket (or more!) 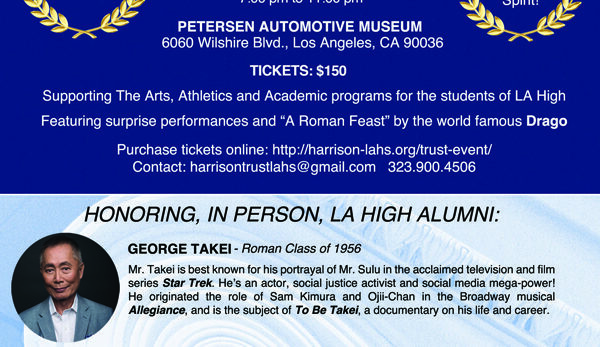 to attend our fabulous Gala at the Petersen Automotive Museum highlighting the history of LA High and honoring LA High alumni, IN PERSON: George Takei, the actor and social justice activist is best known for his portrayal of Mr. Sulu on “Star Trek;” Milt Larsen, magician, entertainer extraordinaire and founder of the legendary Magic Castle; and Gerry Brown, Grammy Award-winning recording engineer and producer, who is credited on over 47 platinum and gold records. 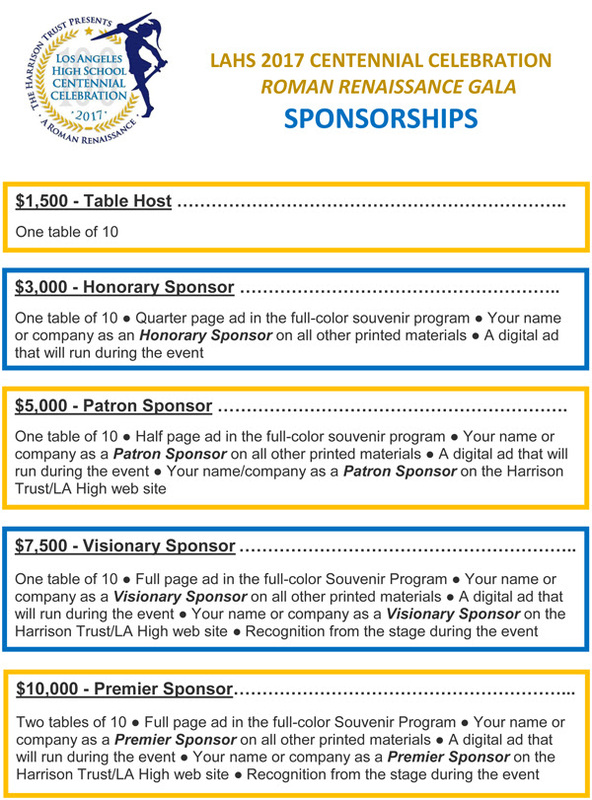 – ABSOLUTE BEST: Become a Centennial Sponsor! All sponsors automatically receive Ad space in the souvenir program and get VIP treatment at our Gala – an evening filled with museum cars, magic, music and historic musings! See sponsor opportunities attached. ​Please feel free to contact me – Joyce Kleifield, harrisontrustlahs@gmail.com or 323 428-9607 if you have any questions or want more info!